The city of Gilneas once lived in uneasy peace with the sprawling, ancient forest that looms beyond its walls. Though the wilderness was grim and forbidding, the citizens of Gilneas—being no ordinary folks—roved and hunted there without fear. That was before a darkness began to fester in the heart of the forest. . . . Before the wicked witch Hagatha cast a dire curse! A sunless gloom now cloaks winding trails, and gnarled branches claw hungrily at passersby. Terrified travelers speak of misshapen shadows flickering in an unearthly mist. In the witching hours, eerie figures have even been seen to stalk the narrow alleys and foggy, cobble-stoned streets of the city itself. Foolhardy travelers who dare venture beyond the city walls after nightfall disappear into the wilderness, never to return. The Witchwood is safe for none to tread! Beginning April 12, join the city’s brave monster hunters as they enter the forest on the trail of Hagatha the Witch in Hearthstone’s newest expansion: The Witchwood! For a limited time* after The Witchwood arrives, log in to claim three card packs and a random class legendary card—both from the expansion—for free! 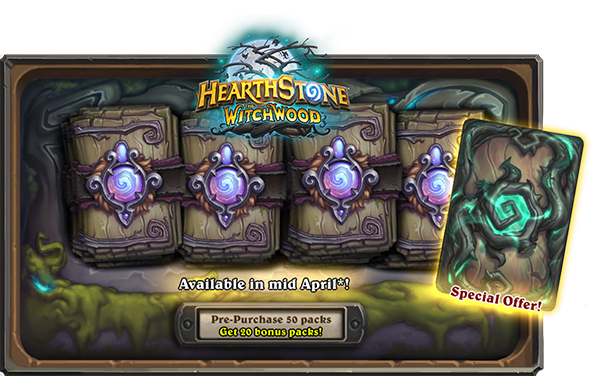 Time is running out to pre-purchase The Witchwood before the expansion launches to receive a special 50 card pack bundle, as well as the In a Dark Wood card back and 20 more The Witchwood card packs as a bonus! You will receive the In a Dark Wood card back and your packs as soon as your purchase is processed, and you can tear into your card packs once the expansion is live in your region. 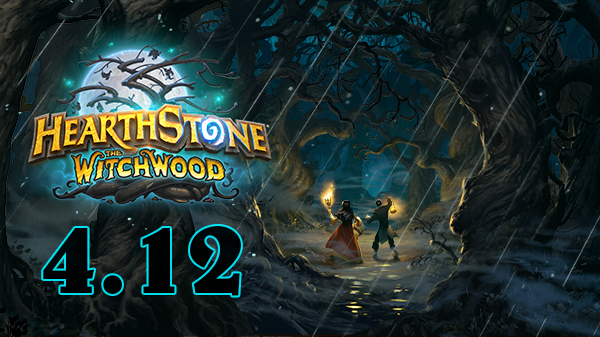 We’ve learned much of what lurks in The Witchwood in recent days, but the time to brave the fearsome forest is drawing nigh, and there are mysteries yet to be discovered in its misty depths before the expansion arrives! Grab a torch, prime your crossbow, and join Game Director Ben Brode and Sean “Day” Plott as they valiantly wrap up The Witchwood card reveal season on April 9 at 11:00 am PDT official Hearthstone Twitch.tv channel! Visit TheWitchwood.com and our official Facebook gallery to see all the cards that have been revealed thus far. Share spooky stories and discuss your favorite moments on Twitter using the #Witchwood hashtag! * Legendary card and three The Witchwood card packs are a one-time offer and available only for a limited time. Offer available until July 10 2018 PDT. Note: Make sure you’ve unlocked daily quests by completing The Duelist quest. It’s also wise to make sure that there’s room in your quest log on release day so none of your quests are replaced!